We started the journey around 8 am. We had breakfast, all was good. The plan was to drive all the way to Alor Setar and spend the night there before heading to Krabi. Having done many long distance drives with Naila previously, it wasn't too difficult, luckily. We arrived in Alor Setar around lunchtime. We checked into the hotel room first, and took a nap before heading out sometime around 4pm. We looked up popular places to eat. Having stayed in KL all our lives, it felt funny that most of the eating stalls in Alor Setar only opens up in the evening! One place we went to seems to have open for business. Turns out only Nasi Ayam is available. Their popular char kuey tiow kerang can only be ordered at 6PM. Feeling a bit flabbergasted, we decided to go to a popular mamak stall in Alor Setar named Restoran Mikamal. I ordered their mee rebus. Very hearty, worth trying. Naila finally falling asleep at Restoran Mikamal. After that, we went to Alor Setar's famous landmark to take photos. You know, typical Asian tourist stuff. Naila was feeling crabby for travelling the whole day, so we took her to the playground afterwards. We returned to the hotel after running around at the playground. That's the end of the first day. How easy and straightforward was the journey. Little did we know what was waiting for us the next day. The following day, we left the hotel around 5am. Headed straight for Changlun to obtain Thailand border pass. The passes are RM1 each. We spent almost 45 minutes here, despite arriving early. Turns out this place was popular with busses and they usually bring a big crowd to get border passes. Maybe we should've gotten the passes the day before or wait until we get to the Immigration office. For more details on crossing the Thailand border and documents needed, please visit here. We chose Bukit Kayu Hitam crossing, thinking this was the big gate, therefore it's efficient. Not efficient enough for a Chinese New Year holiday I suppose. By the way, don't bother stopping at the Malaysian free-trade zone unless you're looking to shop for perfumes and stuff. It's really not worth it. There's no surau or eating place. Even the toilet is located OUTSIDE the air conditioned building, and not that clean either. We were greeted by the LONNNNGGG queue at Thailand Bukit Kayu Hitam border. Halfway through the queue, I got down and queue on foot for the Malaysian side. Then walked about 500 metres to the Thai immigration all the while thinking it will speed things up. Oh yeah give way to the pregnant lady. Annnddddd I was greeted by this queue at the Thai border. It was very confusing, people were short on temper, the guards were like tigers. They growl in Thai if you ask questions. I wasn't even sure if they spoke Malay or English at all. I made sure to look extra pregnant to gain sympathy but unfortunately there's no pregnant mommy lane here. Hubs and Naila arrived half and hour later. Thankfully she was in high spirits and find the whole thing quite amusing. I was sweating in fear of queuing up at the wrong line. That would set us back 1 hour. But earlier I've inquired from the insurance booth on the Malaysian side as to where to queue up, and luckily I was in the right lane. Make sure to prepare a few Ringgit per person for 'tips' when they chop your border pass. Hubs put in RM1 in each passport and we were growled at. Ok rude. It's pretty cold up here, compared to KL. I dunno what they're complaining about. All in all, we spent 3 hours at the border for Malaysian passport clearance, Thai passport/border pass, and for car grant/information of conveyance. It does *(#*)% on your driving morale. By the end of the ordeal, we were so tired even though it was only 9.30am. One word for the border experience: grueling. The border is where I felt regret for agreeing to undertake this 'adventurous scenic travel'. Although, I don't think it's as bad on normal days. Maybe it's just our timing. The drive from there is again, pretty straight forward. Just do note that our Waze started showing weird routes to Krabi, almost doubling travel times so we decided to switch to Googlemaps. Thailand trunk roads does not have tolls. The roads are spacious and free of pot holes. It was a pleasant drive overall. For most of the journey you'll be looking at plantation. Only till you enter Krabi province will you start seeing tall limestone hills. After another 4 hours, we finally arrived at Ao Nang, Krabi. As a conclusion, the travel from the border to Ao Nang took 7 hours including the border crossing and the total distance is 800KM from KL. Is it worth the trouble? I'd say if you were without children, yes, why not cross it off the bucket list. If you're with children, you gotta be extra patient, and employ strategic planning especially at the border. Hey Mommy !! 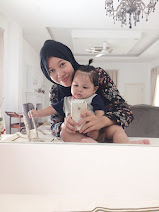 I stumbled over your blog when I was googling about KL to Krabi by car....Husband & I are planning on a road trip with our 3 year old lil girl..Thanks to you I gained some extra tips...Need to read your next post about your stay in Krabi.